Enjoy the flavors and aromas of the Greek countryside with this unique gourmet gift set featuring an organic extra virgin olive oil pressed from 100% Koutsourelia olives grown on the slopes of Mount Parnonas in the Southern Peloponnese, and a high-quality organic balsamic vinegar made from local Agiorgitiko grapes combined with fresh pomegranate juice from the Greek Ermioni variety grown near Ancient Sikion. The colorful gift box features an extract from a painting by Greek artist, E. Lelekou. In the year 2000, Greek TV and film director Manousos Manousakis and his family decided to revive a unique olive grove at the foot of Mount Parnonas in the historic village of Sellasia near Sparta in the Laconian Peloponnese. For the Manousakis family, organic sustainable agriculture is both a necessary and realistic alternative to chemical-intensive farming. They understand thoroughly that excessive pesticide use, soil degradation and genetic homogenization of crops threaten the biodiversity of the countryside, the water we drink and the quality of our food. After years of painstaking devotion, their products have reached the peak of quality they were seeking, and have begun to share this truly special olive oil with all those wishing to experience the authentic flavors of the Peloponnese. Award-winning oil crushed from a blend of Tuscan varietals. Great gift! A gift set sampler with three unique oils from Tuscany. 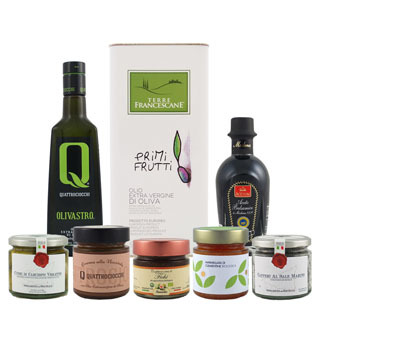 Three unique olive oils from Tuscany in a gift package.